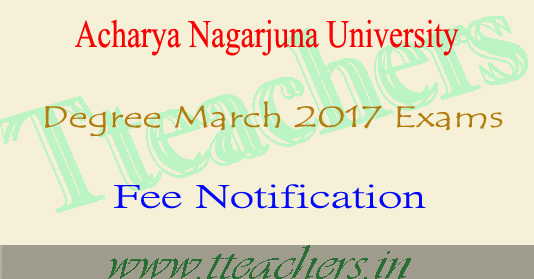 Nagarjuna University anu degree march 2017 regular exams fee last date : ANU Degree B.Sc@ B.Sc. (HS)@ B.Sc. (ASLP) @B.Com(G)@B.Com. (Voc)@B.Com (Res)@B.A@BCA@ BAOL@BHM@BBM@BBM(Hons) Examinations Fee Notification 2017 has released by the branch officials on 22.11.2016.Acharya Nagarjuna University(ANU) degree 1st 2nd 3rd year courses regular annual exam fee dates notification 2017 available at www.nagarjunauniversity.ac.in .Candidates who are studying B.Sc@B.Sc. (HS)@ B.Sc. (ASLP) @B.Com(G)@B.Com. (Voc)@B.Com (Res) @B.A @BCA@ BAOL@BHM@BBM@BBM(Hons) of I,II, & III years can remitt the fee on or before 7th Dec 2016 to appear for the Annual Examinations in March/April 2016 which will be conducted from 04.03.2016 during the academic year 2016–2017. Sub:- ANU - Degree Exams – Regular Examinations March, 2017 – Date of Commencement and Schedule for payment of Examination Fee – Communicated – Reg. I am by direction, of the Vice-Chancellor’s announcing the following schedule for the Regular Degree Examinations of B.Sc./B.Sc. (HS)/ B.Sc. (ASLP) /B.Com(G)/B.Com. (Voc)/ B.Com. 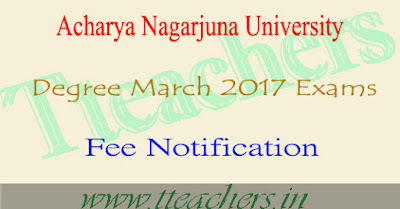 (Res)/B.Aanu degree exam fee dates 2016 2017,acharya nagarjuna university ug regular fee dates 2016 2017 2018,anu bsc bcom ba exam fee notification march 2017,anu degree time table 2017,anu degree 1st year 2nd year 3rd year fee dates and time table 2017 2018/BCA/BAOL/BHM/BBM/BBM(Hons) Examinations of March, 2017.
to Addl. Controller of Examinations, A.N.U. The Vice – Chancellor has ordered to collect the, Original Degree Certificate fee as Rs.520/- ( Rupees five hundred twenty only) from the regular III Year students i.e Y14 Batch appearing March 2017 examinations, to issue Original Degree certificate directly to the colleges concerned. I am also to inform that the candidates who are admitted during and after 2007-2008 academic years in regular stream in the above U.G. Courses are eligible to appear for the regular degree examinations to be conducted in March, 2017. The following are the examination fee particulars for payment of fee for March, 2017 Regular Examinations, through Online Challan in Examination Fee A/c No. 30908794589 of Acharya Nagarjuna University. I year admission (in addition to the examination fee). The Principals are requested to kindly Co-operate by adhering to the last date for payment of Examination Fee. The Principals are further requested to credit the examination fees collected from their students to the University Online Examination Fee A/c No. 30908794589 along with the list of students year wise and also submit the list of eligible supplementary candidates who paid fee directly through Online Challana in Examinationanu degree exam fee dates 2016 2017,acharya nagarjuna university ug regular fee dates 2016 2017 2018,anu bsc bcom ba exam fee notification march 2017,anu degree time table 2017,anu degree 1st year 2nd year 3rd year fee dates and time table 2017 2018 Fee A/c No. 30908794589 of Acharya Nagarjuna University. The Gallies along with Fee particulars should be submitted to the Additional Controller of Examinations, Achaya Nagarjuna University in Triplicate and One Soft Copy also as per the schedule. The colleges having the stock of degree examination application forms for B.A./B.Com./B.Sc./ B.Sc. (HS)/ B.Sc. (ASLP)/B.C.A/B.B.M/B.A.O.L./ BHM may go ahead with getting them filled by the students. In case of colleges where the stock of application forms is exhausted or additional stock is required the Principals are requested to depute a representative of the college to the University with a clear specification of the requirement of application forms for B.A/B.Com/ B.Sc /B.Sc(ASLP) B.Sc(HS)/B.B.M./ B.C.A/BAOL /B.B.M(Hons)/BHM separately for collecting the same from the University Office. In case of the candidates who have studied in other University area Colleges and admitted into II/III year course in your college, a copy of this University permission order, certified copies of other University Marks list (s) and transfer fee payment particulars should be submitted along with the corrected ENRs. In case of transfer with in this University area colleges, the payment of transfer fee particulars should be submitted alongwith ENRs. The Degree examination section has been observing several irregularities in admission and registering the candidates for the examinations. The vice-Chancellor, having considered the issue, has ordered that every college should depute a staff member dealing with Examination work to this office along with the corrected OMR Forms of II and III anu degree exam fee dates 2016 2017,acharya nagarjuna university ug regular fee dates 2016 2017 2018,anu bsc bcom ba exam fee notification march 2017,anu degree time table 2017,anu degree 1st year 2nd year 3rd year fee dates and time table 2017 2018years for scrutiny and verification of correctness of the draft gallies meeting the expenditure from the college funds. The final gallies will be sent to the college only after thorough scrutiny of the ENRs. The Principals are requested to note this important point for necessary action. I once again request you to give vide publicity about the schedule of dates for payment of examination fee to all the staff and students of your college. The Principals are requested to submit the Degree final years students optional papers, Course wise, indicating students Roll Nos. from so and so Sl No --- to -- so and so Sl No’s for each optional papers, and send Question papers requirement to the Coordinator, UG Exams.. Note :- 1) The Principals of all the affiliated Degree Colleges of ANU are requested to visit the University website “ www.anu.ac.in” regularly for all the information relating to the examination section circulars. 2) From hereafter the correspondence will be sent through e-mail –id So, please check e-mail web site of your college regularly.